It is said that America is the land of liberty. There are few other countries that boast as much freedom of choice or options for pursuing the “good life” as does the United States, albeit one unfortunately defined by consumption. We are free to buy, consume, and throw away as much “Stuff” as our individual economies allow. In the process, we experience the fleeting euphoria of acquiring new Stuff. New eventually becomes old, and then becomes unwanted. Where this unwanted stuff usually ends up is in a landfill, a super sophisticated waste management strategy that involves digging a massive hole in the ground and burying undesirables. And it’s not just our personal stuff that gets buried in landfills. By far and large, most of the waste produced is the result of industrial processes from “fabricating, synthesizing, modeling, molding, extruding, welding, forging, distilling, purifying, refining, and otherwise concocting the finished and semi-finished materials of our manufacturing world,” according to sustainable businessman Joe Makower (Leonard, 2011, p. 185). Landfills provide a convenient solution for the shortcomings of our society’s relationship with the stuff it produces and no longer wants, but like any pat answer, it only masks the underlying problems. The mentality of “out of sight, out of mind” only gets us so far. In the case of landfilled stuff, it invariably transmutes itself, through a variety of chemical processes with the aid of trapped moisture, into a toxic sludge called leachate that escapes the protective linings of its prison and poisons nearby soil and ground water supplies. Thus has been the unfortunate experience of Chicago Heights in lower Cook County, Illinois. According to the Illinois Environmental Protection Agency’s Bureau of Land, Chicago Heights plays host to four abandoned landfills, the absconded children of the municipality and the manufacturers it has housed over the years, and its groundwater supplies have reaped the consequences. 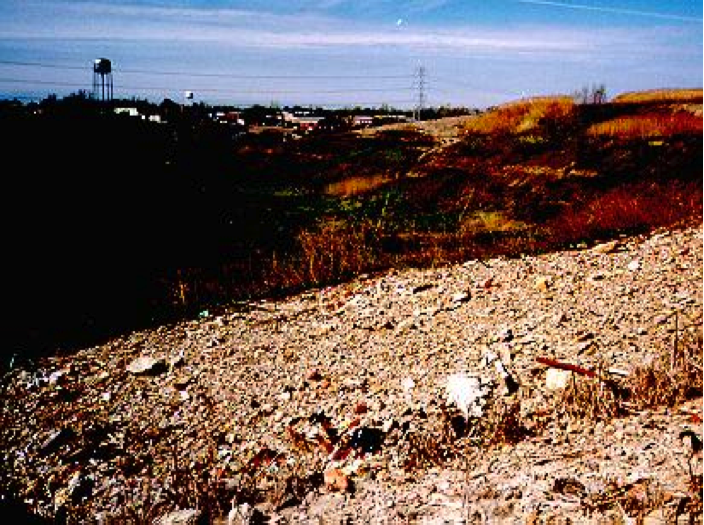 Read the entire text of Travis Dominquez’s article, “Chicago Heights: Abandoned Landfills and Groundwater Contamination” here in pdf or Word format. Banner image: downtown Chicago Heights (Wikipedia).